Gracie performed at Monmouth's most popular restaurant, Meling's Motel, every Wednesday, Friday, Saturday and Sunday. According to an interview she did with Senior Life and Leisure in April of 1994, Gracie said, "I average three hours a night, four on Sundays. I start to play when I get twenty people. I figure they can afford to pay me then. When the audience leaves, I leave. The reason I play is because I love to eat--they feed me free of charge you see." One community member fondly recalls Gracie playing a special song upon his family's entrance of the restaurant. Whenever they walked into the diner, Peterson stopped the song she was playing and immediately welcomed them with the special song. Dr. Gary Willhardt recalls dining at Meling's restaurant while Gracie played, fondly speaking of her ability to carry on a conversation while simultaneously playing the piano. This is a testament to her gift as a pianist as well as an example of her infectious, larger than life charisma. 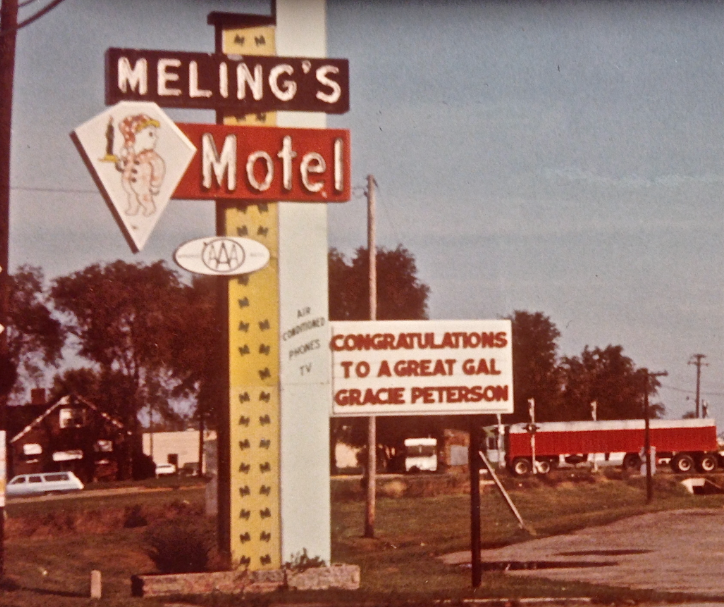 Meling's wishes Gracie congratulations on Gracie Peterson Day in 1970.